I first got wind of drummer and composer John Hollenbeck about five years ago, not so long after I moved to New York City. According to the Village Voice, there was a smart new music scene bubbling up in the East Village at a healthy distance from the well established, capital-D “Downtown” scene centered around the Knitting Factory and Hollenbeck was somewhere near the center of it. In specific, something besides java was brewing at alt.coffee, a homey little Internet café that resembled a college dorm room with a service counter. Every Monday night, the venue played host to the Refuseniks, an intrepid little trio of musical explorers comprised of Hollenbeck, accordion player Ted Reichman then making waves as a member of Anthony Braxton’s latest bands and David Krakauer’s turbocharged klezmer trio and bassist Reuben Radding. Many patrons did their level best to ignore the group as they surfed the web, but eventually word began to spread about the new music percolating at the coffeehouse. Radding’s premonition proved accurate, the Refuseniks never saw Claudia again. “We tried to continue the relationship with casual fibs,” Hollenbeck says, “like, ‘Hey, I saw Claudia on the street,’ or ‘Claudia left me a message that she is definitely coming this week.’ But Claudia maintained her absence. Eventually, Radding joined her, abandoning New York in pursuit of higher education. 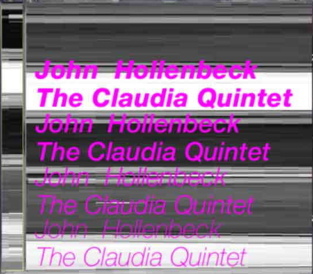 After a few months, Hollenbeck gathered a group of friends to form a new quintet. Alongside Reichman, the drummer enlisted the staggeringly inventive vibraphonist Matt Moran (who would come to be his closest musical partner), clarinetist/saxophonist Chris Speed and bassist Drew Gress. Moran was as yet unknown to most New Yorkers, but Speed’s slippery microtones and Gress’s assertive melodicism were familiar elements of saxophonist Tim Berne’s teeming music. Surprisingly, Claudia joined the new band as well, as its namesake and resident muse. “I called the group the Claudia Quintet in homage to Reuben,” Hollenbeck says, “and I also wanted the group to have a sensitive, feminine quality.” He hoped to downplay his leadership, in order to emphasize the ensemble. Since he intended to have the band play fully notated works as well as improvisations, Hollenbeck also saw in the name a parallel to the conventions of chamber music ensembles like the Arditti Quartet. Whether intentional or not, Claudia lent yet another quality to her namesake a slippery sort of elusiveness that makes the band impossible to pin down and define. Is the Claudia Quintet a jazz band? A chamber ensemble? Truthfully, like its antecedents from the Modern Jazz Quartet to the Anthony Braxton Quartet, the band is both, and everything in between. A classically trained composer, Hollenbeck girds the opening “Meinetwegen” with rigorous structure yet the music moves and lives and breathes naturally, flowing organically from an initial melodic kernel. Voicings shift amongst groupings of clarinet, vibraphone and accordion establishing the group’s signature shimmer while Gress’s solid drive and Hollenbeck’s light, lithe beat give the track undeniable propulsion. True to the paradoxical Claudia, somehow “Meinetwegen” is simultaneously swift and unhurried. “a-b-s-t-i-n-e-n-c-e” weds scrabbling free improv to odd-metered funk, while revealing both percussionists’ penchant for extending their sonic palettes through the use of cheap plastic toys. “Love Song for Kate” allows Gress and Speed to wax unapologetically rhapsodic in one of Hollenbeck’s loveliest melodies. The three “Thursday” pieces paint a composite portrait of Hollenbeck’s “favorite day of the week,” from the luminous church chords of the first segment through the Morton Feldman-inspired static washes of the second and the simple children’s song of the third. “Burt and Ken” is one of the first pieces Hollenbeck wrote for the quintet. The title is a clever twist on the names of its two real-life dedicatees. The two distinct characters are sketched as deftly as Florestan and Eusebius, Schumann’s compositional ego and id. ” after a dance, we have a pint with Gil and Tim” refers to Gil Evans, who inspired the pastel modal vibraphone and military drum patterns of the second section, and Tim Berne, whose angularity is echoed in the first section. Hollenbeck refers to “No D” as a “Braxtonish prog-funk ditty,” proving that even at its brainiest, he intends the music to be fun for both player and listener. The concluding “Visions of Claudia” recaps the Claudia saga, from initial admiration to growing frustration and, eventually, angry resignation. Still, her loss is clearly our gain. Claudia may have jilted Hollenbeck in his Refuseniks days, but in an odd way she inspired him to assemble one of New York’s most consistently creative, innovative and hard to pin down bands, and endowed the band with her elusive mystery. Thanks, Claudia wherever you are.